The Sacrament of the Anointing of the Sick was previously most commonly administered to the dying, for the remission of sins and the provision of spiritual strength and health. 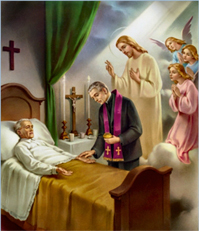 In modern times, however, its use has been expanded to all who are gravely ill or are about to undergo a serious operation, and the Church stresses a secondary effect of the sacrament: to help a person recover his health. If you or a family member are ill or housebound and would like to see a priest to receive the Sacrament of the Sick, or the Sacrament of Reconciliation (or to be visited by a priest or Extraordinary minister bringing Holy Communion), please contact us with the details. Our Parish also has strong links with Whipps Cross Hospital, which it has served since the hospital's foundation, but patients (or their families) must request a visit - tell the hospital staff you wish to be visited by the Roman Catholic chaplain. Please note that confidentiality is strictly respected. In an emergency situation within the Hospital, please ask the Hospital to page the on-call Catholic Priest.